FESTIVAL EXPERIENCES AND "PIG OUT VILLAGE"
The Mid-Atlantic's Biggest Rock Festival will feature three days of today's best rock—along with legendary classic artists—playing on four stages, a world-class BBQ village, and top notch camping facilities. Soundgarden (Friday), Def Leppard (Saturday) and Avenged Sevenfold (Sunday) will headline a bill that also includes A Perfect Circle, Korn, The Offspring, The Cult, Volbeat, Mastodon, Papa Roach, Three Days Grace, Seether, Chevelle, Alter Bridge, Tesla, Pierce The Veil, The Pretty Reckless, Eagles of Death Metal, Highly Suspect, the recently added Of Mice & Men, and more. Pig Out at Carolina Rebellion! Not for the faint of heart, Pig Out Village is where your taste buds go to Rock! Dig into four styles of BBQ and a smorgasbord of savory eats and sweets. Indulge in everything from custom pie cups and doughnuts to bacon flights and wood fired pizza. The 2017 Monster Energy Carolina Rebellion Pig Out Village will feature the following food selections: Up In Smoke BBQ, Master of Patties, Queen City BBQ, BBD's Restaurant, Joe's Doughs, Pele's Wood Fired Pizza, Mac Attack, Angry Bird Grill, Porchetta, Ooowee BBQ, and Eat. Rock. Repeat. presents: Bacon Invasion, Pie Hard, and Nice Tots Little Philly. Look for more surprises to come! Stop by the Monster viewing deck to refuel and meet some of your favorite Carolina Rebellion artists! Monster Energy will be keeping all Rebels fueled up and ready to rock by offering free sampling on their Monster Energy viewing deck. Enjoy Monster Energy drinks from one of the best seats in the house. Make sure to check back throughout the festival for a schedule of Monster Energy's interactive artist experiences. Most companies spend their money on ad agencies, TV commercials, radio spots and billboards to tell you how good their products are. At Monster Energy, we chose none of the above. Instead we support the scene, our bands, our athletes and our fans. We back athletes so they can make a career out of their passion. We promote concert tours, so our favorite bands can visit your hometown. We celebrate with our fans and riders by throwing parties and making the coolest events we can think of a reality. "Taste of Tennessee" invites visitors to come out and tour the nation's oldest registered distillery from outside the Jack Daniel's Hollow. Visitors get to see (and smell) whiskey dripping slowly through charcoal and the new oak barrels used in maturing Tennessee's finest whiskey. The Experience is open to all fans, 21 years old and up, for tours free of charge. Stop by the Jack Daniel's Experience for interactive engagements throughout the weekend. Zippo Encore will be back in action at Monster Energy Carolina Rebellion and they can be your ticket to see intimate, acoustic performances by some of your favorite bands at Zippo Sessions taking place in a secret location throughout the weekend. Visit the Zippo Encore area for details and check out their full stock of Zippo lighters, including the limited edition festival designs! Come by and spin their wheel for great prizes, enter their Zippo Custom art contest, and get your Zippo lighter filled for free. The moments spent with friends are the ones that really matter. As you're rocking out at Carolina Rebellion, make sure you grab some cold Bud Lights. With Bud Light, you're not just drinking beers, you're building friendships. Rebels 21+ can take a break in the Pabst Blue Ribbon Chill Zone with a cold PBR! The Chill Zone will be located in center of all the action and will feature games, fun, and a place to Chill with your friends. We're bringing the Pabst Vandalism spray painting exhibition and invite all 21+ rockers to come get their hands dirty and show off their creativity! Can't wait to kick it all weekend long! FYE is the ONLY place to score your favorite Carolina Rebellion artists' latest CDs and Vinyl at the festival and even get a chance to get it signed! We will be hosting artist signings all weekend long — follow us on Facebook and Instagram for the latest signing schedules. See ya in Charlotte, Rebels! The Music Experience features all things a musician needs to ROCK OUT! The interactive exhibit features your chance to test out your inner Rock Star with guitars, basses, amps, drums, keyboards and electronic gear that are used by today's most popular bands. After laying your hands on the hottest equipment available, you will walk away feeling like a rock star! 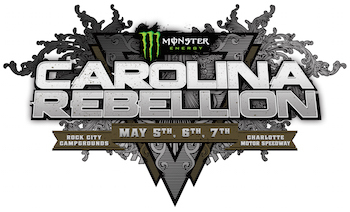 Monster Energy Carolina Rebellion is produced by Danny Wimmer Presents and AEG Presents and is part of the World's Loudest Month concert series, which features the biggest names in rock music performing in eight distinct U.S. concert atmospheres in during six consecutive weekends in April, May and June of 2017. Monster Energy Carolina Rebellion is supported by great corporate partners including Monster Energy, Jack Daniel's, Zippo, Bud Light, FYE, Deep Eddy Vodka, The Music Experience, Pabst Blue Ribbon, Fxck Cancer, and more.